Sister Manju and Father Abhishiktanand are the co-founders of DARE – a nonprofit dedicated to aiding abused and neglected children in India’s northern Uttar-Pradesh region. It is next to the Varanasi railway station, a regional transportation hub, where more than 300,000 passengers pass through daily, where the Catholic nun and priest have managed to enter a monstrous shanty town where children are subjected to daily abuse and neglect. Children who are disabled, or have the simple misfortune of being female, are often abandoned to their fate. Misery is the order of the day in Charbhuja Shahid, the shanty town built of junk and where its denizens manage to make homes in stolen and abandoned vehicles. Children who are lost or abandoned, sexually exploited and enslaved, hungry and alone, live next to the railway and make their living through begging, theft and prostitution. Many turn over the 20 rupees they make each day to their parents or adult exploiters, who expect to profit from the children’s shame. Some children are sexually exploited by the thousands of Indian and foreign tourists who come through the train station to find sexual partners in the bathrooms. Children are expected to bring a daily minimum of money to their adult handlers or face beatings. Children run alongside moving trains so as to receive cigarette butts discarded by travelers into their open extended hands. They will take anything that is resaleable, such as plastic which they can sell for 45 rupees per kilo. Some offer water in refilled bottles to passengers on the trains. “Sometimes it is not enough,” said Sister Manju sadly, “and they wind up in the bathrooms,” where the children are sexually abused. It is Sister Manju’s smile that is the key to being welcomed into the slum, in addition to the trust and admiration she has gained by saving as many children as she can while serving the rest. In the nearby city of Varanasi, Sister Manju and Father Abhishiktanand opened a shelter for girls approximately 5 miles away from the station. It is currently home to 30 girls. However, Father Abhishiktanand (who is known to everyone as Abhi) says that no one in real danger is ever turned away. When asked why he helps his fellow children, Raju answered “They deserve a better life.” He lives in a junked minivan, along with a dozen other children. He carries a rag, as do other children, soaked in a powerful chemical solvent that they chuff to become intoxicated and thus mask the stench of feces and misery in which they eke a living. Sister Manju seizes the rag and forcefully throws it way, even while she knows that at just 10 rupees it is difficult for children not to take recourse to such an escape from a harsh reality. She smiles again, seeking to prevent Charbhuja Shahid’s black mire from sapping her energy, Sister Manju manages to wade through the mountains of plastic bottles and refuse. In her immaculate Punjabi-style costume, she greets her neighbors in a place that the world would rather ignore. A woman stops Sister Manju and asks her to take her son. Sister Manju has already taken in the boy’s older sister and reminds the woman that the DARE center only takes girls. They both know, however, that exceptions are made. Last year, three children were rescued from platform at the nearby railway station where their mother lay dead next to them. One of them was a girl of just a few months of age. They were all taken in at first, while the boys were eventually sent away to a shelter operated by another organization. The girl remains at the DARE center. Shelters operated by the state, “are not an option,” says Sister Manju, because the children there are subjected to mistreatment and abuse. 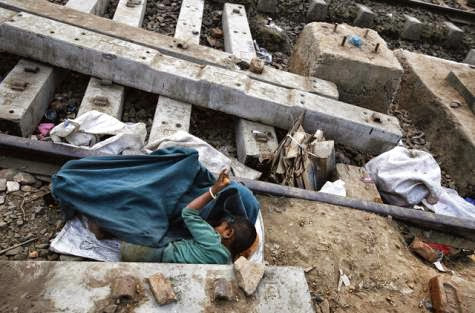 “For them it is better to stay at the train station,” said Father Abhi. Sister Manju lowers her voice when she speaks of her enemies in the slum. She explains that the misery and exploitation is so profound in Charbhuja Shahid that not even drug-traffickers or arms dealers have found a haven there as in the case of Brazil’s famed “favela” slums. Her enemies are the men and women who live in the squalor of the railway slum who profit by exploiting the children who she is trying to save. The adults take the money mostly to purchase alcohol, says Sister Manju. “They don’t even do it to enrich themselves,” in a morass of human misery where not even evildoers have hope. Sister Manju merely laughs when asked what role the police and other government authorities play. While she credits them for legally documenting abandoned children and then passing them on to DARE, she notes that they also take bribes from the very children who are being sexually abused. Not even the police become very rich from their corruption, though. Both Sister Manju and Father Abhi are hopeful that change may come to Charbhuja Shahid. They are planning to build a center to rescue boys and to expand the facility for girls. Among the residents at the current rescue center is Nisha, a 12-year-old girl who was rescued after being subjected to the worst kind of abuse. At first, she missed her life along the railway tracks which was the only life she knew. Nisha is now getting good marks in school, and it is children like her that Sister Manju and Father Abhi expect who can someday provide hope to the lost children of Charbhuja Shahid.